When it comes to steam cabins, its hard to bypass the Florenta Quadrant Steam Room Cabin from Aqualux. Measuring 900mm x 900mm, this steam room has an abundance of features and benefits that make it one of the best value cabins around. AMAZING DEAL!!!!! LIMITED TIME ONLY!! The Aqualux Florenta Quadrant Steam Shower Cabin offers a perfect retreat to help soothe and relax your tired aching muscles whilst allowing you to listen to your favourite music and radio. Including 6 Body massage jets to help refresh and relax you, whilst the steam will nourish and detoxify your skin leaving you with a healthy glow and feeling of well-being. Each session can help lose up to 300 calories! So for those of you looking to lose a little weight, this is a perfect supplement. 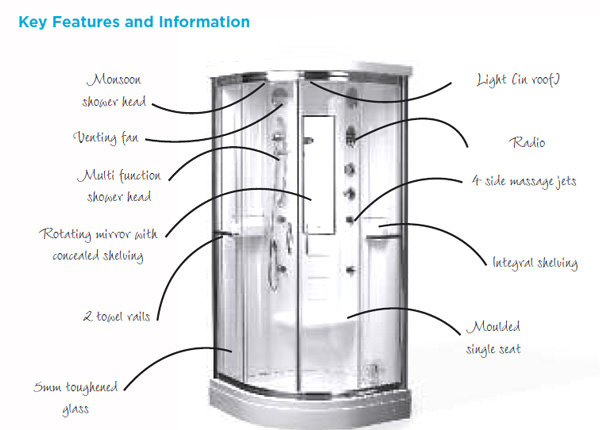 Completely self-contained relaxation pod with steam and shower capabilities. The Aqualux Steam Cabin also comes with a two year manufacturers guarantee! Additional Installation Notes: Electrical: This steam shower cabin requires 1 x 13amp electrical supply. It comes with a plug and RCD fitted, however we recommend you remove the plug and have the cabin installed to a fused spur. If you have an RCD fitted within your mains board you may also remove the RCD fitted to the shower flex. Water: The cabin requires 1 x hot and 1 x cold water supply. The household water pipes should be fed to a point approximately 1 metre off the floor in the corner where the cabin is to be fitted. Balanced water pressure is required, between 2-3 bar. If using a gravity fed system we recommend you use a shower pump, to provide the required water pressures. We do not supply pumps. The shower cabin is a freestanding product and as such we would recommend your fitter does not fit the shower into locations that mean the cabin cannot be moved away from the wall if needed. The couplings on the cabin to connect to your water supply are standard 15mm compression fittings.